Jaguar is fitting its newly improved InControl Touch multimedia system from the new XE to the granddaddy of the range: the new 2016 model year XJ. Hardly a great surprise, but our new spy photos are the first unofficial confirmation that the touchscreen tech is making its way up the range. Click here for more spyshots of the outside of the facelifted XJ. Design chief Ian Callum's team hasn't mucked around too much with the interior of the XJ limo, judging by these new pictures. This is A Good Thing. We've always admired the XJ's cabin - probably more than its Marmitey exterior styling, truth be told - and we can see the maritime 'gunwhale' line ringing the passenger compartment is untouched. Most of the switchgear and controls are unaltered, too. But there are two key differences we've spotted from our scoop pictures. The InControl Touch system from the XE appears to be fitted here; we can tell by the new 'soft keys' below the large touchscreen; they mimic the functions of the buttons in the smaller saloon, controlling use of telephone, music, parking cameras and satellite-navigation. Note also the refreshed digital dials. From this close-up spyshot, it looks like the rev counter switches to the left and now includes coolant temperature and fuel gauge, with a gear selection read-out too. The needles are now truncated stubby affairs, like on a Merc, so the centre of each digital instrument can display more information. For instance, the speedo now has - you guessed it - the speed in digits, alongside the 'analogue' reading. We can't quite tell from this picture, but it looks like the right-hand dial will be configurable, like on a Porsche. We'd imagine this instrument can beam up a map detail or infotainment options at the flick of a steering wheel button. 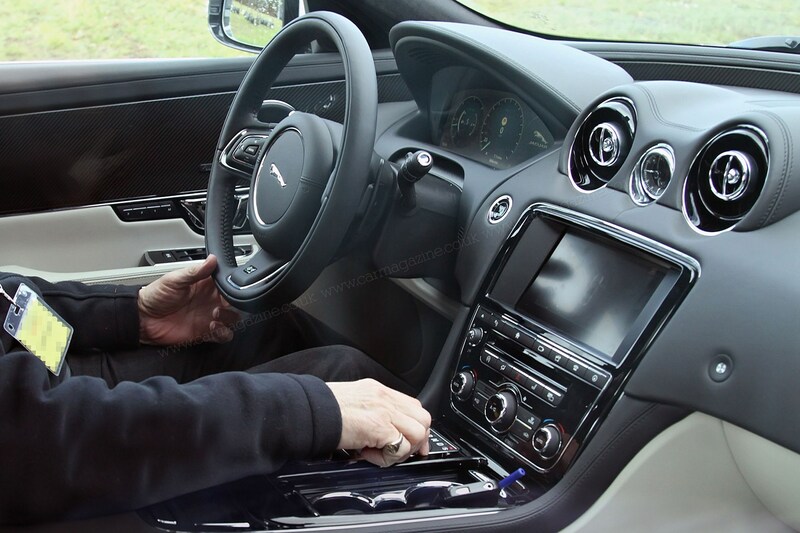 When will we see the new 2016 Jaguar XJ? We're not expecting this car at the 2015 Geneva motor show next week. Instead, word is that it will be unveiled at the Shanghai auto show in April - in time for a summer 2015 dealer launch in the UK. Click here for our earlier scoop on the new Jag XJ facelift.